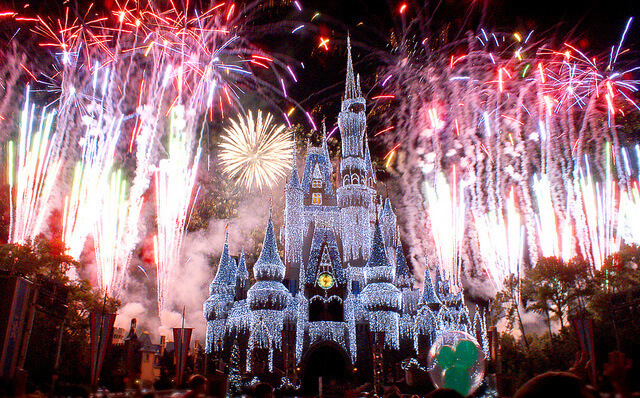 P op the cork on the New Year at Walt Disney World with a New Year’s Eve celebration filled with festive music, a spectacular fireworks display and delectable culinary delicacies. On New Year’s Eve, the Magic Kingdom opens from 8 a.m. to 2 a.m with a host of family friendly fun for the New Year at Walt Disney World! At 12:00 p.m. and 3:30 p.m., you can catch the Festival of Fantasy Parade, and once the sun sets at 6:30 p.m., the Main Street Electrical Parade begins as dazzling floats light up Main Street, USA. But don’t forget to look up towards Cinderella’s Castle so you and the family can enjoy Disney’s Celebrate the Magic! projection show, when Cinderella’s famous castle comes to life! At 7:30 p.m., the Holiday Wishes fireworks display commences, and at 11:50 p.m., the Fantasy in the Sky fireworks show starts the countdown to midnight and the New Year. Once 2015 officially starts, the Disney’s DJ dance party begins in front of the castle, where you can party until 2:00 a.m.
Have you celebrated the New Year at Walt Disney World? What was your favorite part?